Auspicious choices bring good luck to the occupants or residents. Naming a home is now becoming very popular with the increase in home ownership. It gives an impression of welcoming a visitor to your abode. When it is difficult to find your home, a visitor may overshoot the premises. According to vaastu, it indicates missed opportunity. So draw attention to your home with a beautiful name, along with a house sign near the entrance of your property in a most welcoming way. Many people in western countries name their homes based on certain themes like birds, animals, locations, and trees. For instance, orchid home, cucu villa, hill view, sea castle etc. In India, people tend to name their homes after the holy river, holy places, parents, god, and goddess, because people believe that an auspicious and lucky name brings good luck and success. People in such a home feel more positive and are able to attract abundance in their life. 1. Avoid duplicating a name that already exists in your area or surroundings. You can select modern and latest but a meaningful name. 2. Use a name which has some personal significance as well as meaning. 3. Select a unique and attractive one. 4. Name written on the door plate should be easily readable. 6. Colors used in the nameplate should be selected based on the directions. There are different elements are associated with different directions. 7. 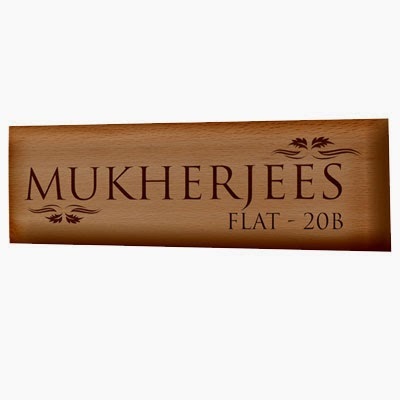 Like colors, the material used in making a nameplate is equally important. Metallic nameplates are very auspicious for the north facing homes. 8. Those who have an independent home or villa can display their house name near the gate and people living in the apartment may create a space near the door. Your home is one of your biggest assets as well as your shelter. Ideally, you want a name to be proud of and that has some local or personal significance. Above all, any new name given should be suitable and well-chosen. 2. Suggestions on the material of nameplate i.e. metal, wood, earth etc.